Introducing you to one of my favorite brick-and-mortar boutiques tucked away in the beautiful Montrose area of Houston Texas. In an oversaturated market, they find that what keeps their clients interested is exclusivity and I absolutely dig their unique one-of-a-kind pieces . It was love at first sight when I met them almost two years ago and I have been dreaming of them ever since ðŸ’•ðŸ’• So thrilled for you to explore and discover my beloved Merchant & Market-where I found the most amazing pieces that I am wearing below and plan on wearing to all my holiday events. The dress is vintage Halston and the sleeveless duster is vintage Saint Laurent and is lined in the prettiest mocha fur. More on these two lovelies later in the post..I pinky promise! As a person who visits Houston every Thanksgiving holiday for the past 7 years, I am always searching for places to go and things to see in the city. I have come to the conclusion that Houston is just begging to be explored and discovered, which is why I'm wholeheartedly up for the challenge every single time. As you know by now, I love a good adventure! And shopping local--well that's always a given and a first stop. After coffee, of course. Montrose is an offbeat neighborhood known for its bars, vintage stores and eclectic mix of eateries, which range from quaint cafes to Mexican cantinas and Mediterranean bistros. Itâ€™s also home to hip indie art galleries and the octagonal Rothko Chapel, featuring huge abstract murals by its namesake artist. With its downtown skyline views, Eleanor Tinsley Park is a popular spot for picnics and sand volleyball. As Austin is to Texas, so Montrose has long been to Houston: a liberal, weird oasis in a sea of red, a refuge for musicians, artists, and bohemians of every stripe. This neighborhood pulls at my heart strings and I end up spending the majority of my time slowly meandering down the streets stopping every few steps to check out the renovated mansions, bungalows with wide porches, and cottages located along tree-lined boulevards. I love the little independent shops and boutiques here and always end up finding way too many treasures. It's a vintage girl's paradise. Two years ago, I had my sights on visiting Merchant & Market. I mean, how could one resist looking inside this intriguing shop?! Instagram-obsessed people ..OMG-this is the place. Fashion lovers, apothecary lovers, home lovers---there is seriously something for everyone here, well maybe not everyone and that's okay. They really have have an eye for things that are out of the box. You can find custom pieces and furnishings that coexist with reimagined finds where artists create and guests are inspired. Wow--so many tempting things. I seriously wanted one of everything. His wife Blanca Vian is my spirit animal. She has the best eye and understands details matter in every single thing you do. She is wildly creative and I am genuinely so inspired by her. She is the brain behind Deansley- which is a part of Merchant & Market. Two years ago I purchased the most amazing oxblood Coach clutch that is still a staple in my accessory closet. I also bought the most amazing Liberty London printed scarf but loved how Blanca had it tied around a hat giving it a new life. I knew then that we shared an eye for interesting fashion and kept in touch ever since. Deansley is a new vintage collection. Something once lost in a closet that has now been found and restyled. Whether pairing a geometric print Halston dress with a western pork pie hat or a dainty slip dress with a tough leather jacket, Deansley is about creating unique combinations and giving vintage pieces a new purpose. They bridge classic, chic, western, grunge, minimalist, and modern styles. Fashion trends come and go but some pieces are timeless and just waiting to be rediscovered and you can find those special pieces at Deansley. This is where the vintage Halston and the vintage Saint Laurent come into the picture. How amazing are these pieces you guys??!! I do not have to worry about wearing the same dress as someone else at a party this season and I have some true conversation starter forever classics in my closet. I love being original and I love adding my own flare making them very unique to Samantha. Don't even get me started on the custom vintage denim jacket she is designing for me. We met on the fit and design and let's just say a girl cannot have too much sequins! I am so excited for this. 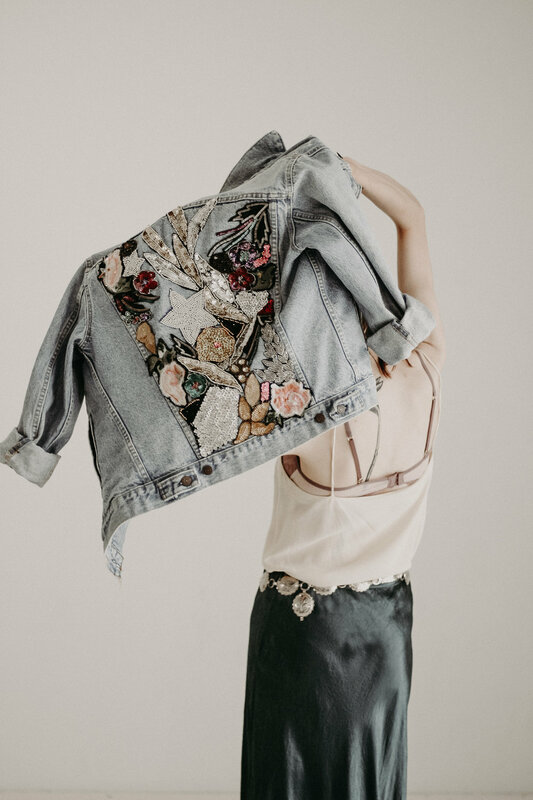 I have truly wanted to start adding some more casual pieces into my closet but just am bored with denim so adding sequins to denim--now this, I can do! I know it will my daily go-to. You can custom order one too for only $450. Inquire here. We can be twinsies! Gino and Blanca left their larger space on Westheimer and when I went to visit this go around I met Blanca at the new location located at 2608 Dunlavy Street. It's the storefront just south of Cafe Brasil. They have decided to do a pop up space this season with The Petaler and Atelier AliÃ©nor. (The best florals and the best espadrilles everrrr BTW) You will still find their collection of beautiful curated goods including furniture, housewares, clothing, shoes, and florals. I really love the intimacy of the new space and am loving watching them evolve and shift. The old location on Westheimer was gorgeous but it was indeed, so much space. I am going to let the photos do the talking here because you just have to see it with your own eyes. But first...if you are in Houston, pay these lovely people a visit. As we met in the shop I had my daughter accompany me, Blanca had her daughter there--Gino brought lunch and I sat there and just absorbed this amazing family living the dream of doing something they love. Entrepreneurship is so lovely to witness. And I left feeling so grateful, not only for these work relationships, but for new friends in my life that I meet along the way. I believe that we meet nobody by accident and Blanca and I were certainly bound to meet and work together in some caliber. We see fashion the same exact way and are so bored with the norms--the jeans with the cold shoulder tops with the booties---how many times can we see it?! Alrighty then--be inspired by Merchant & Market and P.S...so many great gift ideas here.... the serving trays are my absolute fave. They would make the perfect hostess gift! What do you all think?!!! What piece are you most intrigued by? !